Cannoli Cake is the answer for anyone craving a delicious dessert that tastes like its Italian namesake. Only this dolce is better, much better. 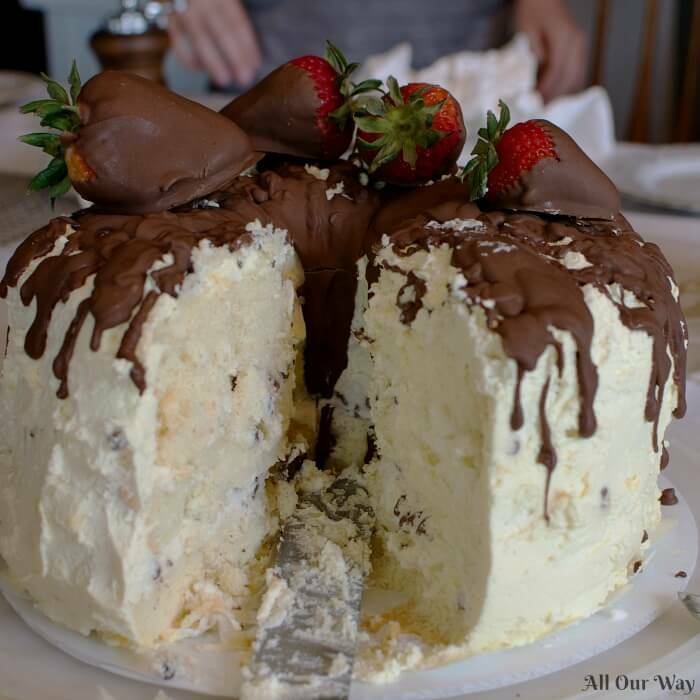 Rich creamy ricotta cheese with mini-chocolate chips fills the three layers of sponge cake. Sweetened whipped cream frosts the cake. And finally, a chocolate glaze with chocolate dipped strawberries embellish this sumptuous dessert. “I’m looking for the ultimate cannoli,” says our daughter, Shelley. “What are you going to do when you find it?” I ask. Well, we certainly can’t resist that request. Honey and I find a “5-star” recipe and we order some cannoli tubes from Amazon. On cannoli day we’re ready to roll, the dough that is. Everything goes along smoothly until we’re ready to fry. It’s the dough ends. They just won’t hold together around the tubes. When we put them in the hot oil they pop apart. To make matters worse, the shells don’t fry up crispy and blistered. They come out misshapen with huge boils under the crust. They are downright ugly. Our one and only attempt at making cannoli turns out an abysmal failure. This year Easter dinner is at our house. We have the menu but we don’t have a dessert. I start looking at magazines and cookbooks for inspiration. We want a little bit of traditional with the excitement of non-traditional, like our Flatbread and Baba Ghanoush. It hits me! 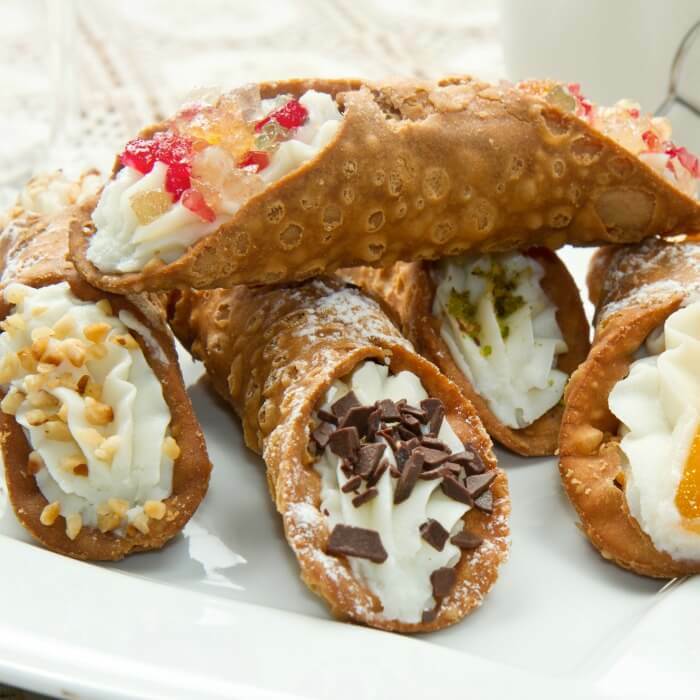 What’s more Italian than cannoli? How about a sponge cake with a ricotta cheese chocolate filling? Classic sponge cake is an easy dessert to make, it’s almost fail-proof. This type of cake is a versatile base that you can dress up with a fancy filling or serve it sliced with fresh berries and topped with whipped cream. The sponge cake bakes in a 10-inch tube pan with a removable bottom. You have to invert the tube pan over a the neck of a glass bottle so that the cake can cool. We think the filling should be sweetened ricotta with mini chocolate chips and the frosting be sweetened whipped cream. At this point, the cake looks pretty good but a bit plain. Aha!! The cake needs chocolate on top, and chocolate dipped strawberries. Perfect! The cannoli cake with whipped cream frosting and chocolate dipped strawberries was a huge success. This is a special dessert for a special occasion. Cannoli cake is based on the Sicilian pastry of the same name. The three layers are filled with sweetened ricotta cheese and chocolate mini chips. 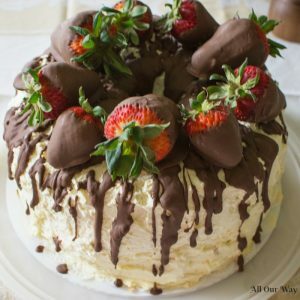 Stabilized whipped cream tops the cake and the delicious dessert is garnished with melted chocolate and chocolate-dipped strawberries. An elegant dessert for a special occasion. 1/4 cup cold water 59 1/8 ml. 1/2 package 14g Sugar free Instant Jell-O Pudding Mix (If you use regular instant pudding the weight will be 48 grams for 1/2 package.) I used vanilla but you could also use lemon. 2 Tablespoons shortening like Crisco - don't use butter because it has water in it. It will make the chocolate seize up. Fresh strawberries with stems - washed and let dry. In an electric mixer with wire whisk attachment, beat egg whites, 1/4 cup of the sugar, cream of tartar, and salt. Start on medium speed, then use high speed until stiff peaks form, 4 to 5 minutes. In a separate bowl, with an electric mixer on medium speed, beat egg yolks, 1 1/4 cups sugar, and vanilla. Beat until light in color, 3 to 4 minutes. Add flour and water to egg mixture alternately. Start and end with the flour. Mix just until blended. Using a rubber spatula, fold egg yolk mixture into egg whites. When blended, spoon batter into an uncreased 10-inch tube pan with removable bottom. Spread batter evenly. Bake for 60 to 65 minutes, or until top is golden brown. Remove pan from the oven. Invert tube pan onto the neck of a glass bottle to cool, about 1 hour. When cool, carefully remove cake from the pan. Use a sharp knife to loosen the outside of the cake from the sides of the pan. Combine drained ricotta, sugar, and lemon extract in a mixing bowl. Stir with a rubber spatula until blended. Stir in chocolate chips. Store covered in refrigerator until ready to use. Cut sponge cake into thirds, horizontally. Place the bottom layer, cut side up, on a serving dish. Spread half the filling over the bottom layer of the cake. Place middle layer on top of the filled bottom layer. Spread remaining filling over this layer and top with third layer, cut side down. Anchor the layers with wooden skewers. Refrigerate until set, 15 to 20 minutes. Combine the heavy cream and the instant Jell-O Pudding and mix together and whip to desired peaked consistency. Frost the top and sides of the cakes with whipped cream frosting. Using a metal spatula, start at the top and continue to spread frosting down to cover cake sides. 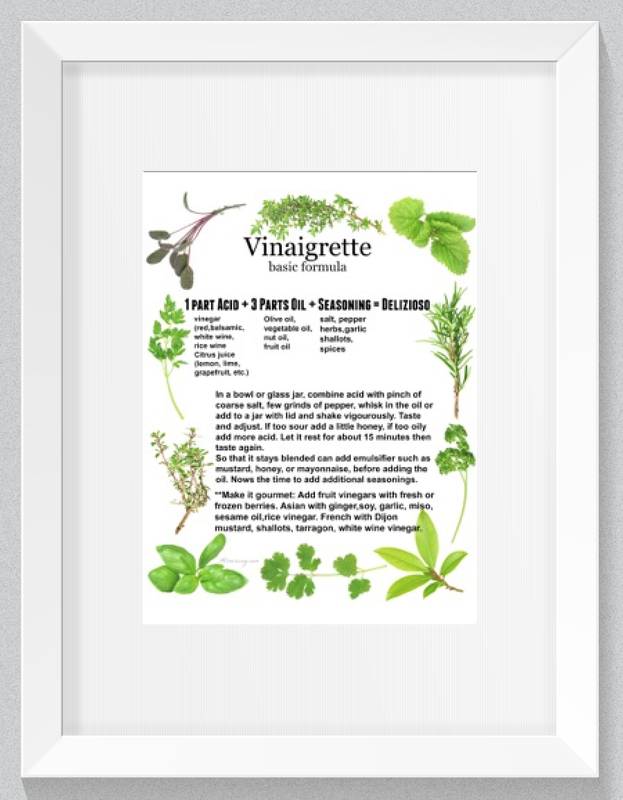 Refrigerate until ready to finish garnishing. Melt the chocolate chips with the shortening in the top of a double boiler or place the ingredients in a metal bowl and place it over a saucepan of simmering water. The chocolate will melt slowly. Once the chocolate is completely melted you are ready to dip the strawberries. Line a baking sheet with wax paper. Working with one strawberry at a time, grasp the strawberry by the top leaves and dip it into the chocolate. Lift the strawberry out and shake gently to remove excess chocolate. Lay dipped strawberry on the baking sheet on its side. Repeat with the rest of the strawberries. Let the chocolate set on the strawberries. Remove the cake from the refrigerator, remove the wooden skewers anchoring the cake layers. 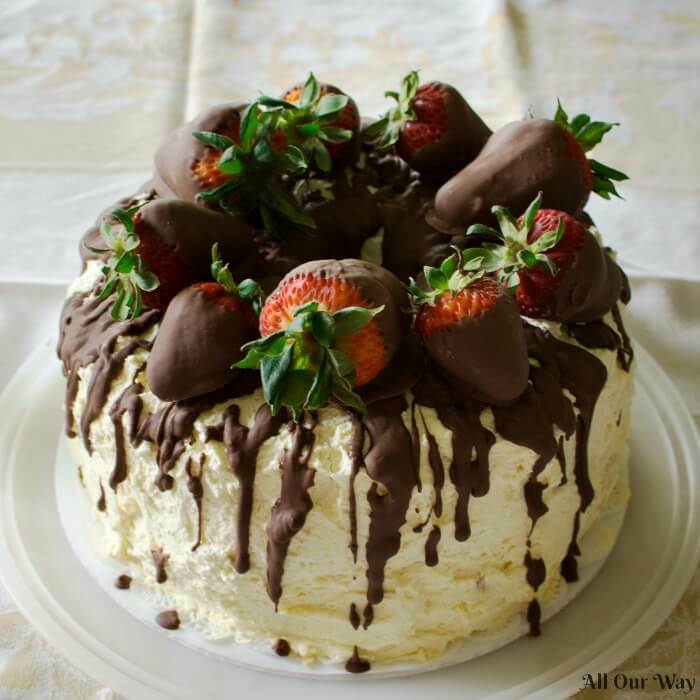 Glaze the cake with the excess chocolate and then garnish the cake with the dipped strawberries. Recipes are adapted from Sweet Maria's Sweet Kitchen and Gretchen's Bakery. This recipe immediately jumped out at me from your page. It looks so decadent and creamy. I especially love the good portion of ricotta cheese you use in this. What a fantastic treat for any occasion – even just me sitting on the couch with a big, fat slice of this is occasion enough! what a creative masterpiece. I love cakes that are a work of art and this is magnificent! I was strolling through google looking for something special and came across yours truly! WOW this is a show stopper indeed … saving this one! Thank you, Claudia! That’s very sweet of you! It tastes better than it looks!! I did a search for a cannoli cake to make and found your recipe. I want to make this tomorrow but don’t have the tube pan you suggest. Was wondering if this could work with a bundt pan since they are similar. My only other option would be to split the batter between two cake pans or make it in a 13×9 pan where I could cut into 4 pcs and stack. Hi, Dawn! If you don’t have an Angel Food Pan I would do it in 2-3 cake pans. I’d cut parchment paper rounds to put in the bottom. Be sure to grease and flour the bottoms. That’s how I do my Italian Cream Cake. I don’t know about the Bundt pan because they usually have ridges in them. You have to cut the layers and fill, so to make it easier I’d go for the cake pans. 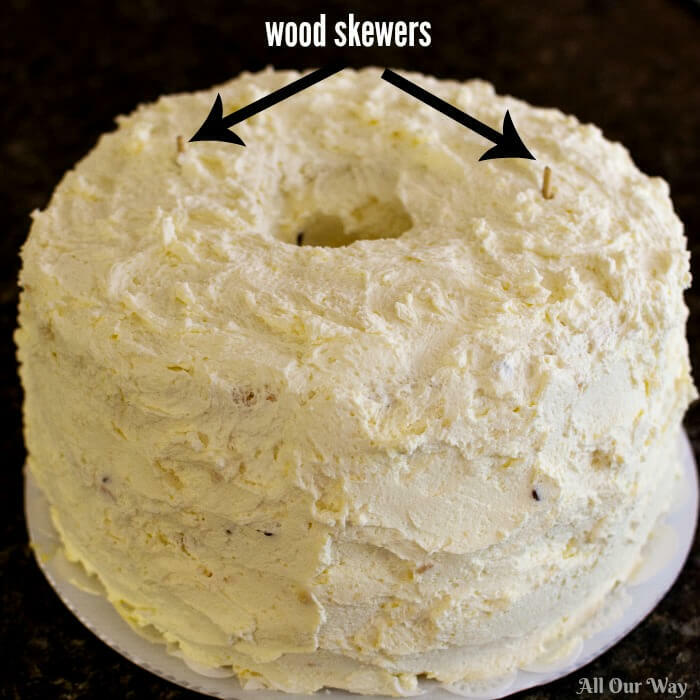 Also, A little trick I use as I’m frosting a layered cake is I take the thin wooden skewers and anchor the cake until the topping gets cold and firms up. Let me know how it turns out. Happy Baking!!! I am baking this cake today and realized I don’t know how long to bake them for as I’m doing them in the cake pans. I’ve done sponge cakes before at a shorter length of time. Is it the same? Hi, Peggy!! I’m so sorry I just saw your question. I apologize for not answering right away. You are correct. You would bake it for a shorter time period. I hope it turned out. Please let me know. Can you please tell me, it may sound silly but what flavor jello pudding?? Vanilla I’m guessing, right? Hi, Kim! Yes, vanilla pudding. I’m sorry, I should have put that in there. It’s great readers like you that catch the omission. I was scrolling through your site for some content to share for my facebook page and saw this LOVELY cake and just had to say something! Marissa – it’s BEAUTIFUL! I don’t know how you could eat it, it is so pretty! I bet that it was as tasty as it is lovely! Hello, Pawan! I am so glad you’re going to try the cake. I certainly appreciate your feedback. Have a wonderful day. I made this yesterday for my friend’s birthday. Super easy and it was a huge hit! Turned out gorgeous! I’d post a pic, but I don’t think it will allow me. Thanks for the fantastic recipe! I’ll definitely be making this again. Hello, Alyssa! Thank you so much for taking the time to comment — I’m glad you enjoyed the cake. I’d love to see the cake. Try to send it to me. Can you try to send to my Facebook page? Have a great weekend. Thank you, Leslie! Very kind of you to say. ? Your cake is a real show stopper, amazing. Thank you, Karen! It’s a cake I’m going to keep making. It really turned out great! Thank you, Sue! I’m excited about making it again. I love cannoli, and this cake looks fantastic! Thank you for linking up at #BloggingGrandmothersLinkParty. I’m sharing your post on social media. Thank you, Carol. The cake certainly had the flavors of cannoli. ? This looks absolutely amazing. Another great share!! Thank you, Donna! I hope you make it and enjoy! Oh. My. Goodness. I am drooling all over my keyboard! Pinned. Hi, Nikki!! Thank you for pinning. It is really good! Thank you, Pat! This was the first time I made the cake and it won’t be the last. If you make it, let me know what you think. Have a great day! I think I’ll make it for my birthday. 🙂 Thank you for commenting, Lori. Oh my, that looks awesome! I bet the taste is awesome too 🙂 Thank you Marisa for linking up at the #BloggingGrandmothersLinkParty. I shared this post. Hi, Dee! The cake tastes sooooo good. Thank you for sharing. This looks like the ultimate sweet treat! Hello, Sandra! The family loved it — I think it’s going to be a family favorite. Marisa, I adore sponge cake, and I love what you’ve done with it here. This is a stunner! Your family is sure to be requesting it for every special occasion from now on! All I can say is ~ YUM! This looks amazingly yummy! I’ve pinned to try someday. Welcome, Megin! I’m glad you stopped by. I’m always inspired by the link party — so many talented posts!! Let me know how the recipe turns out when you make it. Oh. My. WOW. I bet an invitation to YOUR table at Easter is quite the hot ticket! This looks absolutely decadent and amazing – perfect for a special occasion! You have done a amazing job.. loved the recipe?? Thank you, Soniya! I wish I could send you a slice, I’d love for everyone to have a taste. This is seriously the most amazing cake I have seen for a while! It must taste so nice, love the chocolate covered strawberries. Funnily enough, I had some yesterday and they were amazing. Great job! Hi, Daniela! Chocolate and strawberries belong together. Thank you for your sweet comment. This. Looks. Amazing! Wow! I mean it looks great but I’m sure it tastes even better. This would be perfect for Mother’s Day coming up too! Hi, Sara! It tasted great! Moist, rich, and not too sweet. Just right!! 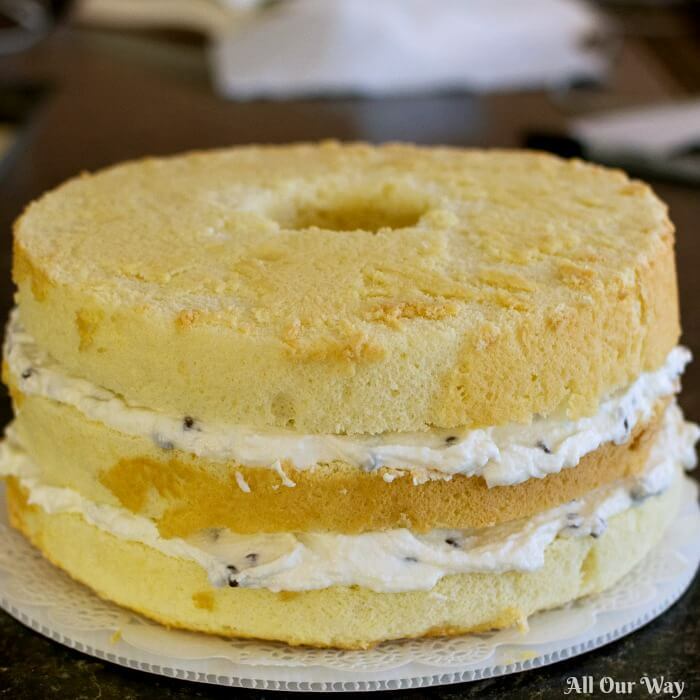 Oh man – cannoli and angel food cake are 2 of my Italian hubby’s favorites. He’d love this one!! Hello, Ashley! You’ll have to make him this cake. If you do, let me know how he liked it. 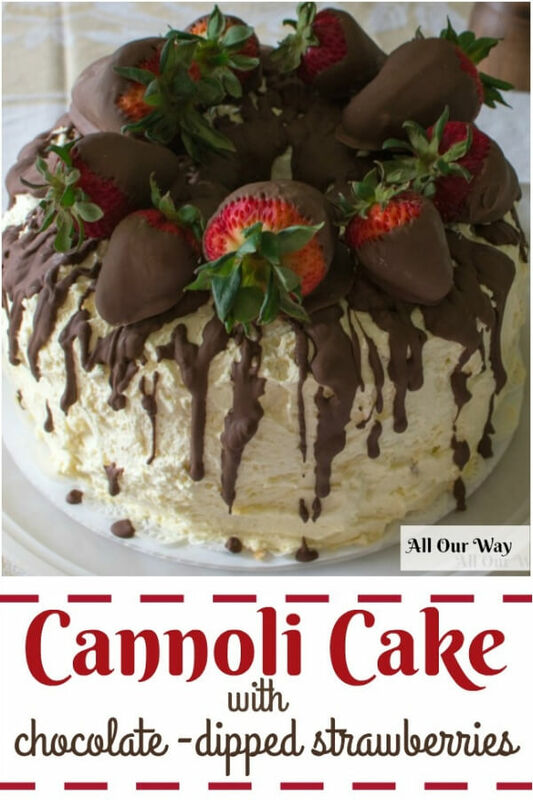 I made cannoli which I like a lot, your cannoli cake is delicious and gorgeous with filling and topping I am in for dig in if you have any left overs or call me when you make next time. I wish I could send you some cake, Swathi! There isn’t even a crumb left. Next time I make it I’ll be sure to give you a call. ? This is sooooo GENIUS!!! Your decorating skills are so great – the cake looks greatly inviting! Thank you, Anne! I’m glad you like the blog it’s so nice to hear that! Have a wonderful day!! Wow.. cake is my weakness, whenever I see any new way to make delicious cake I make it and eat it. thanks for this post dear. You’re welcome, Mamta! I don’t make a lot of desserts but when I do I like to make them special — and that it was! Marisa, after baking for my month long baking marathon, I am finally telling myself to take a break and not bake anything and here you are with this gorgeous cake of yours. The flavors are just amazing and I am literally drooling for some right now. How I wish we lived closer so I could have had a taste of this lovely cake. Hi, Sandhya! I’ve been following your marathon — whew — you have certainly been making a lot. I am excited about making the cake again, I really liked that it wasn’t overly sweet. Wowza!! That is one stunning cake and since I am a huge cannoli addict I am sure I will gobble up this cake in no time! Love, love, love! Thank you! We haven’t totally given up on making cannnoli, but this cake recipe is a keeper. Oh how beautiful and delicious does this sound? I’d love to have this for my birthday. Yum..
Hi, Veena! I’d love to make it for your birthday, I just don’t think it would travel well. You are such a fantastic baker, perhaps you can make it for a family member and keep half? Oh my what a gorgeous cake, and that topping is out of the world!!! I m just salivating as i read thru your description, sweetened ricotta cheese,oh my i m hungry now!!! Thank you, Priya, that is so nice of you to say. I’m not a dessert maker, normally, I’m really happy with the way it turned out. Hello, Adriana! Perhaps someone will surprise you with it?? I think I’ll make it for my own birthday. ? OMG…can you make this for my birthday?? We have this wonderful Italian bakery…and they make this wonderful “puff pastry” cake…I don’t know the actual name….but I’m sure you do. Sometimes when I am really lucky I will get it for my birthday. After seeing this….I have changed my mind! I’d love to make you the cake, Gloria! And this time I’d take a photo of it before placing in the fridge. That chocolate gleamed and looked as rich as it is. Once in the fridge, it loses some of its luster. Have a great weekend. I’m definitely making the cake again. We’ve got some birthdays coming up and I’m anxious to make it. Wish I could send you one. OMG!! Marisa you have really outdone yourself this time! What a gorgeous cake…….I have to clean my computer table, now. Looking at those pictures of the cake had me “drooling” all over! Before you get rid of those cannoli forms, why not try one or two different recipes. So many people make these, there has to be a good, workable recipe out there. My other suggestion would be to put the dough in a pizzelle maker (like a waffle iron). When it is beautiful and golden brown, wrap the dough (while still warm) around one of the cannoli tubes. Let it sit till cool, and you should have a cannoli to fill….and the best part is—-no deep frying! Ciao, bella! I love the pizzelle maker. And better yet no frying. Honey and I will give it another go because we hate to cry uncle. But I have to admit the cake did turn out great. It was like a work in progress.I kept doing different things until I thought it worked. Shelley, my daughter, helped me out because the finishing touches were put on Easter. If the cannoli don’t turn out I could always try to make them into windchimes? Abbracci!! I love the wind chime idea!! You’re welcome over anytime!! I’ll make something special — unfortunately, the cake is gone. I’ve got the Whole 30 book. It really looks nice on my bookshelf. ? I have loved cannoli since I was a child. Our own daughter samples it as a cake at the wedding of my nephew. When she was married six years ago ‘cannoli’ was a part of the menu. Fortunately we were able to purchase the shells so did not have to go through the frying aspect. There were many willing hand available to fill them as well as enjoy them! Hi, Lisa! Do you know of any DIY crafty things I can do with cannoli tubes?? I didn’t realize you could purchase the shells but I now see that Amazon has them. I hate to give up — we’ll probably attempt the recipe again but that cake was beautiful. Have a great day — hope your neck of the woods is raining up a storm. Are you kidding me? That is one delicious temptation I would be hard pressed to resist. The combination of flavors is sensational. So it was a good thing the cannoli failure happened. It led to this magnificent cake! Ciao, Linda! Would you believe I all I got was a crumb of a taste? The dessert, what was left of it, went home with the kids. I had to ask everyone what they thought of it. It was a huge success. Oh my how gorgeous and decadent is that! What a magnificent cake you have made. My mother used to make a cannoli cake but it was in a rectangle shape and nothing like you have here. The topping is amazing. I bet that cake did not last long on Easter. Thank you, Jovina! It didn’t last long and all I got was a lick — the kids took what was left home, with our blessing. That cake would have been too much of a temptation around the house. The beauty was it wasn’t overly sweet — just enough. Writing about it is making my mouth water. I’ll have to make it again!